HAVE A DICKENS OF A CHRISTMAS! Like King Lear, every actor reaches a point in his career where he wants to stamp his mark on this classic, so you have to be really quite special to compete with the crowd. Fortunately, this reading by Tom Baker IS really quite special! Forget your Peter Capaldis, your Matt Smiths, even your David Tennants – Tom Baker was THE Dr Who and there will never be a better! Who else could carry off a hand knitted stripy scarf and make it a cool fashion trend? But when he wasn’t saving the planet, Baker had time to play many other roles, including a stint at the National Theatre – not to mention being a very fine Puddleglum the Marshwiggle, beloved of Narnia fans everywhere. He is also an accomplished voice-actor both on radio and as narrator of several animated series. I approached this recording of A Christmas Carol with some trepidation because, much though I like Baker, for me the definitive version is Patrick Stewart’s and I doubted Baker could match him. I was wrong – Baker brings drama, fear, sorrow and ultimately joy to the story just as much as Stewart does. As with all of the best of the Dickens’ narrators/performers, Baker has a huge personality and a powerful voice – necessary to fill the shoes of Dickens’ larger-than-life creations. Although this is a straight reading, Baker uses his fine acting skills to give each character an individual identity. Unlike the Stewart version where we hear only his voice, this one has occasional background music and other sound effects at the more dramatic points, and these work well with Baker’s performance. I intended to listen in instalments but by the time the first disc ended, I was so hooked I ended up listening to the whole thing in one session. Not better than Stewart (not possible!) but as good, and of course this is the unabridged version. Three hours of pure listening pleasure – this set has now joined my select collection of Christmas Carols, to be brought out and savoured time and again over many Christmases to come. Just the thing to ensure that you Have a Dickens of a Christmas! NB This disc set was provided for review by Amazon Vine UK. Currently not available as discs on Amazon UK. FictionFan – Now that’s a real endorsement if you think this is as good as Stewart’s. I’m most impressed and intrigued. Just might have to seek this out. I love Tom Baker’s voice – and he really got all the emotions out of the story. A great performance! If it’s not too much of problem, would you mind explaining what Dr. Who is all about? I can’t really wrap my mind around it. Oh that’s easy. He’s timeless and ageless – one might say older than the mountains yet younger than the stars – with the ability to visit different worlds. He has a variety of unusual weapons which he uses to fight strange creatures. And just when you think you’re getting to know him, he changes…most enigmatic…but very sweet! Hmmm….sounds like a dadblamery, for sure. But the professor always looks the same. And there’s only one. You would like Puddleglum…Let me see…I really liked Tash. Thought he was coolio looking. No, not at all. Practically every review interests me. You’d get sick of me saying stellar, so I take some breaks from it. No, no, the Professor changes his look frequently – sometimes top hat and beard, sometimes dimples, occasionally full Samurai kit…a master of disguise – it’s all very confusing. Look here, just figured out another difference, Aravis. The professor is wicked not sweet. BUS is the sweet one. Just remind me – is Aravis the girl…or the horse? The Professor is both, unless he’s implying that BUS is sweeter than FF, in which case he’s really, really wicked! The girl, of course. I wouldn’t call FEF a horse, would I? From what I’ve gathered, BUS is supposedly not too sweet. Probably lead a more normal life? The last Pertwee series was in colour, I think – I seem to remember that his coat was plum-coloured. Yes, I liked Troughton too – he was not so much darker as more serious if that makes sense. a treat for your ears. 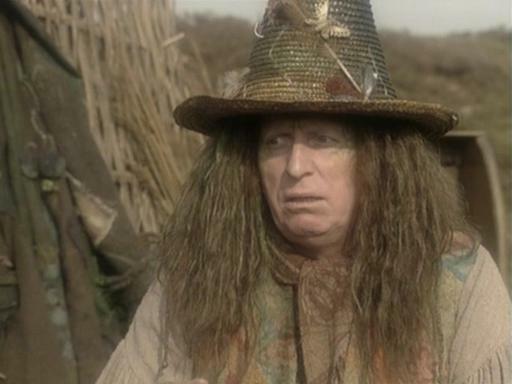 You are absolutely right, Tom Baker was the definitive Dr Who. I actually had the full length scarf knitted for me by my Aunt Helen. It was great to see Tom in the 50th Anniversary episode of Dr Who. Sadly, no-one knows how to get on Vine. It’s invitation only and seems to be totally random. The only thing we’re sure about is that you have to have posted at least a few reviews on Amazon. I’d only posted four reviews when I got my invite but other people have posted hundreds and still no invite… NetGalley is better for books though, these days. Happy New Year, Kevin – hope 2014’s a good one for you and yours! Either of these actors could make reading the phone book sound thrilling!